Arena Multimedia is the VFX, multimedia, web & graphics designing and animation education academy of Aptech Limited. Since 1996, Arena has successfully trained more than 450,000 students around the world. The Academy provides world-class education to prepare students for creative careers. The animation industry is one of the fastest growing industries worldwide. The global 3D animation market will be worth over $21 billion by 2022. Further, the industry is growing at a rate of around 11 percent per annum*. There is a huge demand for trained & certified professionals to meet the needs of this growing industry. 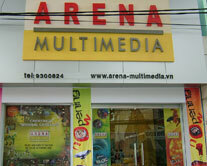 Arena Multimedia fulfills this demand through quality education in multimedia and animation. For details of multimedia courses from Arena, click here. To become an Aptech business partner, fill this form. We will contact you soon. **Disclaimer: The companies/ organizations/ agencies mentioned on this page are strictly examples used for representational purposes only. Aptech does not claim or guarantee any ties or placements with any company/ organization/ agency whatsoever.